The spotlight this month is on our upcoming development close to Avon Beach in Mudeford, Christchurch. These contemporary homes will consist of two beautiful four-bedroom properties, approximately 3,025 sq Ft in size. Situated in the peaceful town of Mudeford, rich in smuggling history and home to the picturesque quay, the town is a popular destination for sailing and windsurfing. With a population of approximately 4,000, this quaint sea-side town is the perfect escape. Not only does the town have everything you would need, but these beautifully designed homes will make you never want to leave. Basque in the sunshine on Avon Beach, approximately 200 meters away or try your hand at a variety of water sports within walking distance of your new home. The perfect location for relaxing whilst remaining close to the hustle and bustle of the town centre where you will find a great range of places to eat and drink. 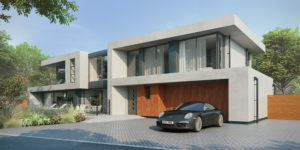 These stunning clean and contemporary homes bring a new and exciting style to the Forays property library. The stunning glass fronted exterior will let in endless light, giving your home that feeling of bringing the outside in to these coastal properties. Due for completion in 2018, there is no doubt that these two properties will fly off the market. The properties offer great accessibility to their surrounding areas, with only a 10 minute drive to the train station and a mere 20 minutes to the nearest airport. With local attractions such as Highcliffe Castle, Adventure Wonderland and the Oceanarium only a stone’s throw away, there is always plenty to do, whatever your interests. Want to feel like you’re in an episode of Grand Designs? Then this could be the perfect property for you. For more information give us a call on 01252 733885 or email us at theteam@forays.co.uk.